Easter Egg by Lord Inquisitor (2008), on Flickr. Don’t clean up. Well, not exactly. Don’t get too excited. What I mean is, keep out your Easter decorations through the season. Easter eggs, bunnies, lilies and chicks provide the visual cues that keep us in the Easter mindset. ALLELUIA! Throw an Alleluia on the end of every family prayer. Nothing says celebrate like an Alleluia! You have to shop and cook anyway, so take advantage of post-Easter sales for some treats at family meals. Lamb and ham, spring vegetables like green beans and beets, and of course some special desserts make for a festive, Eastery meal. As the bulbs and trees continue to bloom, remind everyone that this is a sign of Easter upon us. If you are doing spring gardening, put in a few special decorative “Easter” flowers. Make meaningful music choices. Simply changing the CD in the player or the song on the playlist can make a big difference. What do you do to keep the Easter season alive in this busy time? 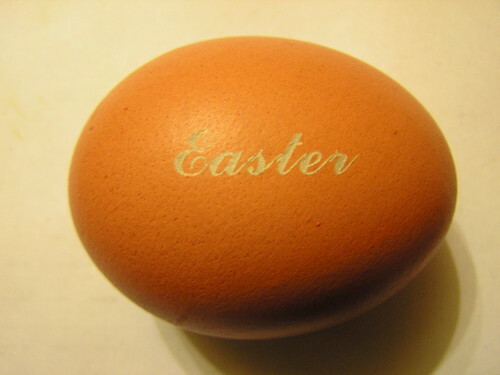 Photo: Easter Egg by Lord Inquisitor (2008), on Flickr.